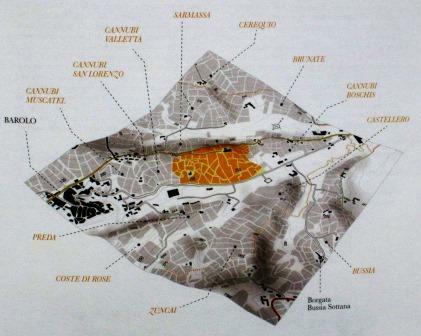 Alessandro Masnaghetti has created some of the finest wine maps ever, and his detailed chartings of the Barolo and Barbaresco vineyards stand as landmarks – in every conceivable sense – of those great zones. 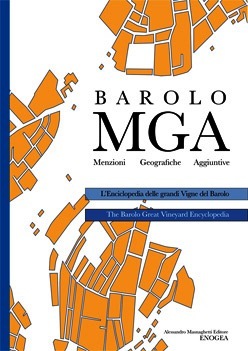 Now he has published a book, called Barolo MGA: L’Enciclopedia delle Grandi Vigne del Barolo; in English (the book is completely bilingual), The Barolo Great Vineyards Encyclopedia. As befits its title, its aims, and the almost eight years of labor Masnaghetti put into it, this is a very big book: 12 by 8½ inches, 407 pages, hundreds of maps, all entries in both Italian and fluent English (Daniel Thomases is responsible for the English translation). It has to be big: It locates, maps, and describes every single one of the 177 geographic sites that have been approved for use on labels. That is what the Italian acronym MGA stands for: Additional Geographic Mentions. Over and above that, it contains the first-ever list of every site name, real or invented, that has appeared on Barolo labels since the 1980s. For the casual wine drinker, all this is no doubt overkill, but for the deep-dyed Barolo lover, it is fascinating information. Here, for example, is the map of the Cannubi MGA, showing clearly its relation to all the sub-sites that are entitled to use of the Cannubi name, which subsequent pages will describe in detail. Considered by many the heart of the Cannubi hill and the whole sub-zone in fact with the exclusive right to utilize this renowned name, this MGA consists of various sectors within its confines. Unquestionably the most famous is the one which looms over the town of Barolo itself and, in general, enjoys an excellent southeastern exposure and equally positive contours and overall layout (at least in the upper-middle part of the hill). The other two sectors, smaller in size, have decidedly cooler exposures where Nebbiolo expresses its full potential only in warmer vintages. At their best, the wines of Cannubi are distinguished, above all in their youth, by elegant and, at the same time, austere tannins. Readers familiar with Masnaghetti’s maps of the various townships of the Barolo zone already know how precise and useful they and the information they contain can be. There are very few people who know as much about Barolo – both the wine and the zone – as Alessandro Masnaghetti, and none who are so devotedly making that knowledge available to the wine public. For information about this and his other projects, look to enogea.it. Barolo MGA is available in the US from The Rare Wine Company. It costs $85 – an excellent Christmas present for a Barolo-loving friend or your utterly deserving self. This entry was posted on November 12, 2015 at 7:00 am and is filed under Barolo, Italy. You can follow any responses to this entry through the RSS 2.0 feed. You can leave a response, or trackback from your own site.